The all new 25th Anniversary production of "Les Misérables," featuring new staging and reimagined scenery inspired by the paintings of Victor Hugo, will play Boston's Opera House from March 13 – April 1, 2012. Based on Victor Hugo’s classic novel, "Les Misérables" presents an epic story about the survival of the human spirit as it follows the timeless characters of Jean Valjean, Cosette, Eponine, Marius and Inspector Javier across the years. The show's magnificent score includes the classic songs “I Dreamed a Dream,” “On My Own,” “Do You Hear the People Sing?,” “One Day More,” “Bring Him Home,” and many more. "Les Misérables" has music by Claude-Michel Schönberg, lyrics by Herbert Kretzmer from the original French text by Alain Boublil and Jean-Marc Natel, with additional material by James Fenton and original adaptation by Trevor Nunn and John Caird. The production is directed by Laurence Connor and James Powell. "Les Misérables" originally opened in London at the Barbican Theatre on October 8, 1985, transferred to the Palace Theatre on December 4, 1985, and moved to its current home at the Queen’s Theatre on April 3, 2004, where it continues to play to packed houses. When "Les Misérables" celebrated its 21st London birthday on October 8, 2006, it became the World’s Longest-Running Musical, surpassing the record previously held by "Cats" in London’s West End. In celebration of its 25th anniversary, the legendary musical "Les Misérables" made theatrical history with an international first -- three different productions playing in London at the same time. The original production (still playing to packed houses at the Queen’s Theatre), the acclaimed New 25th Anniversary Production at the Barbican (where the show originally premiered) and a celebratory concert at The O2 Arena. The O2 Concert was presented in more than 500 cinemas throughout the United States on November 17, 2010, and is now available on Blu-ray DVD. The Broadway production of "Les Misérables"opened at the Broadway Theatre on March 12, 1987, and transferred to the Imperial Theatre on October 17, 1990, running for 6,680 performances. The US National Tour began in November 1987 and visited more than 150 cities before closing in St. Louis in 2006. Broadway audiences welcomed "Les Miz" back to New York on November 9, 2006, where the show played the Broadhurst Theatre until its final performance on January 6, 2008. To date, "Les Misérables" remains the 3rd longest-running Broadway production of all time. 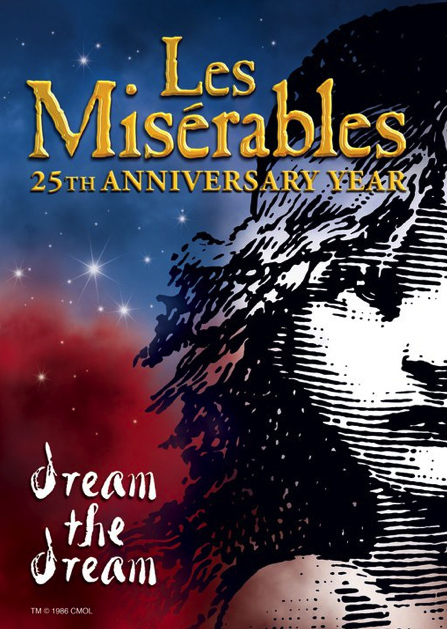 Seen by nearly 60 million people worldwide in 42 countries and in 21 languages, "Les Misérables" has 36 cast recordings to its credit, including the multi-platinum London cast recording, the Grammy Award-winning Broadway cast and symphonic albums and the soon to be released live recording of the New 25th Anniversary Production. The video of the 10th Anniversary Royal Albert Hall Gala Concert has sold millions of copies worldwide, making it one of the best-selling musical videos ever in the UK. Cameron Mackintosh is currently developing a film version of "Les Misérables" to star Hugh Jackman. For tickets and information, stop by the Opera House box office at 539 Washington Street, any Ticketmaster outlet, call 1-800-982-2787 or visit www.BroadwayInBoston.com.